Kabini forest is the home to the single largest population of asiatic elephant. These elephants congregate during the dry season ( feb- apr) and offer unparalled experience to the enthusiasts. This forest is also abode to over 300 species of birds, herds of gaur, chital, sambar and tiger. Cuisine : They offer mouth watering buffet of both veg. and non. veg delicacies, mostly local in flavour. Season: It is best during feb to april, when it is dry, to spot congregation of elephants. During rainy season, june - aug, foliage is lush and dense. Tariff is per person per night with Safari. Check in 12 noon & check out 11 am. Cost includes stay, all meals, jeep safari into Nagarhole national park, Coracle ride, elephant ride( subject to availability), forest entry fees, camera fees & taxes. Basic Tariif is inclusive of Boarding, Lodging and Activites. Commission is only on the basic tariff. GST is calculated at 18% on Basic and Forest entry fees. Net charges are inclusive of Basic, Forest Entry fees and GST. 22nd Dec to 31st Dec 2017 Sesonal tariff applicable. 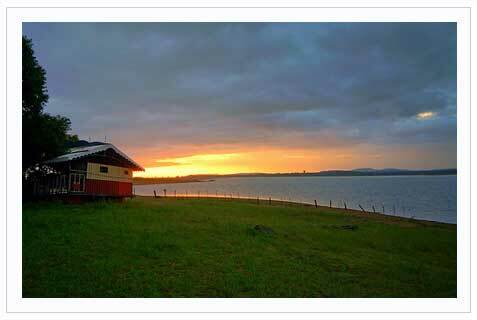 Kabini river lodge is 220 kms from Bangalore, 80 kms from Mysore. You need to take Mysore - H.D. Kote road, reach H.D. Kote hand post and proceed to kabini forest. There are enough signages by Jungle lodges and resorts at crucial points.